Dog’s Breakfast is my quintet’s first CD release in 7 years and features Mike Murley on tenor saxophone, Brian O’Kane on trumpet and flugelhorn, Lorne Lofsky on guitar, Steve Wallace on bass and me on drums. Dog’s Breakfast showcases 5 of my new compositions plus 4 of my arrangements of rarely heard jazz gems. 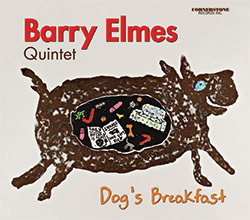 The album title Dog’s Breakfast reflects a number of things, including the rather eclectic program of jazz music presented on this CD. The five new compositions are drawn from a broad range of experiences and sources of inspiration. They are also composed using several different approaches (two were created from melodic ideas, one from a rhythmic figure expanded on the drum set, another is a contrafact and one is based on the sound of a favourite chord voicing). The four songs by other composers are selected from show tunes, old movie soundtracks, and lesser known jazz repertoire. Then there’s my love of dogs. They crack me up. Particularly my own dog Mavis (a rescue from a ‘high kill’ shelter; possibly part Labrador Retriever, part Border Collie, part goat). The CD cover employs a print of artist Sa Boothroyd’s work “The Dog’s Breakfast” which hangs on our bedroom wall. It's pretty much the first thing I see when I get out of bed each day and it helps put me in the right frame of mind before I begin to tackle reality for another day. “Little Sunflower” receives a slightly more aggressive treatment here than the original recording by composer Freddie Hubbard. The inspiration for the rhythmic chord ‘punches’ in the ‘B’ Section comes from playing this tune many times with Cedar Walton on various club dates in Toronto. I always enjoyed the way Cedar energized this tune with his ever-changing rhythmic figures under the longer melody notes. “Dog’s Breakfast” was composed while walking Mavis-the-dog along the beach at our cottage one afternoon. The simple melody and rhythm, plus the use of muted trumpet, try to capture the carefree delight that Mavis finds in discovering and eating discarded items every minute or so as we walk along. Her taste in ‘food’ seems rather eclectic and includes such delectable items as plastic coffee cup lids, dirty tissues, discarded candy wrappers, dead sea gulls, rotting fish, shoe inserts, tin foil, pretty much anything. “Beautiful Love” appears in the soundtrack for a number of films, but my favourite is the The Mummy from 1932. Our trio version starts with the drums alone playing the melody. If you know the song, just hum the melody to yourself while I’m banging away; your frame of reference will be the same as mine and (hopefully) you’ll hear how my drumming relates to, and expresses, the melody. And if you don’t know the song, don't worry, Lorne plays the melody on the guitar at the end. “Pierre Berton’s Pig” is a party song dedicated to the memory of socialite Nancy Phillips and her wonderful, crazy dinner parties. I met her while performing with Guido Basso on a 'jazz cruise'. Nancy loved creative artists of all persuasions and for many years took delight in bringing them together via her parties. Dinner was always followed immediately by a ride on her fully restored backyard circus carousel. You could choose from any of the brightly coloured carousel horses and other animals to ride. But there was one solitary pig, which always caught my attention. Nancy would say to me: “Barry, I think you should ride the pig…you know, Barry, Pierre Berton always rode the pig!” Well, I've read and enjoyed most of his books, so if riding a pig somehow puts me in the same company, however briefly, as the great Canadian author Pierre Berton, hand me the reins! “Spring Can Really Hang You Up The Most”, the sole ballad on this recording, was brought to my attention many years ago by Lauren Jenkins. We were young undergrad students in the new jazz program at York University and we played this long tune as a trio, with Lauren on tenor sax and Al Henderson on bass. The song spoke to me the first time we played it, but for some reason I never performed it again with any band, including my own. It still arouses deep feelings in me, I don’t know why, so forty years later I finally arranged it for the quintet. “Right As Rain” is my attempt to intentionally compose a happy song. Not something I normally do. Like many jazz compositions, this one is a 'contrafact' (a new melody applied to the harmonic structure of another song). I’ll leave it to you to figure out which popular song it is based on. The title is one of those commonly used phrases that actually makes no sense. I recall receiving the following advice from our family doctor when I was a teenager: “Barry, don’t worry, just do blah-blah-blah and you’ll be right-as-rain!” But since when is there anything particularly right about rain? “Katie’s Blues” is a tribute to longtime CBC radio host Katie Malloch. It was composed in 2012 and premiered at the Rex Jazz Bar in Toronto at a party to honour her retirement from the CBC. It was never performed again until now and I’m pleased to include it on this recording. I first met Katie in 1985 when she came to Toronto to record Time Warp’s trio performance at the Art Gallery of Ontario for broadcast on her weekly show Jazz Beat. From 1983-2007 Jazz Beat featured the music of contemporary Canadian and international jazz musicians and it was during this same time period that I and others of my generation were trying to build some sort of professional jazz career. Katie’s on-air support really helped spread our message. And for many of us who got to know her personally, her off-air support and friendship saved the day on numerous occasions. Thanks Katie! “Sonar” is, for lack of a better description, a ‘chamber-jazz’ piece written by pianist Gerald Wiggins and drummer Kenny Clarke. To promote this concept, I added a second harmony line for guitar in the ‘A’ sections so that, instead of the usual ‘melody-plus-chords’ approach, this arrangement features three independent lines that collectively express both the melody and harmonic structure. And if you are not familiar with pianist/organist/vocalist/composer Gerald Wiggins, he's an interesting character well worth checking out. His professional career included jobs as diverse as accompanist for comedian Steppin Fetchit and vocal coach for Marilyn Monroe.